Introducing book 11 in this phenomenally successful series which kids from the ages of 8 to 12 can’t seem to get enough of, especially boys who love humour! In fact the series is so popular it’s one of the most successful of children’s series ever published in world history, having won handfuls of children’s choice book awards. 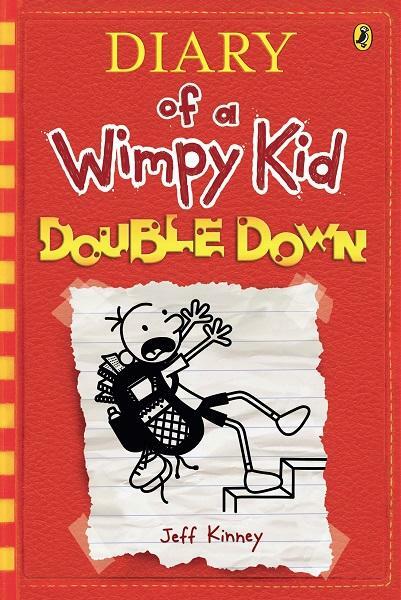 As millions of children will tell you, the Wimpy Kids books are animated diaries of Greg, an ordinary school boy. Of course they are formulaic but it’s testament to the American author that he has his pulse on how children think and the kinds of experiences they have in their lives. In Double Down, Greg’s mum thinks that video games are ruining Greg’s mind: she wants him to stop playing them and to explore his ‘creative side’ instead. While practicing with his school band on his French horn, Greg, with a rip in his pants, is being helped by Rowley to disguise the hole when Dad comes in. Dad says that Greg and Rowley were ‘goofing off’ instead of performing with the band, and bans television and video games for two weeks. Greg subsequently discovers a bag of gummy worms which inspire him to get his mum off his back by making a movie. Perhaps he’ll become rich and famous as a result! Typically, the story is told throughout from Greg’s point of view, with any speech, thoughts, or sound effects shown in balloons. There are frequent uses of font sizes and shapes to add interest to the reading experience. Here is a poem in an anthology which includes Greg’s poem: ‘My turtle Fred/He is not dead/He sleeps in his shell/And when he dies/I guess he will smell. The text is always written on ruled lines such as one would see in a child’s school exercise book, and there are black and white cartoon illustrations on most pages which break up the text and make it look more readable for a reluctant reader. Kinney has explored many aspects of childhood in his Diary of a Wimpy Kid, and doubtless he will find more to continue this world-popular series. Who knows how many titles he can come up with? The latest statistics are that the series has sold over 165 million books globally and in 54 editions in 49 languages.